A calculator which helps work out the value of your gold. A calculator which helps work out how much Zakâh to pay on unpaid Zakâh wealth from previous years. Option to enter different amounts for each year. Displays Zakâh due for each year and the total Zakâh due on all previous years. A historical nisâb tool to get past nisâb prices in tabular and graphical format. 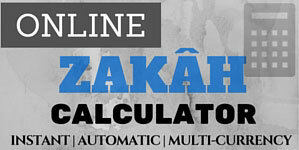 A Zakâh Calculator which can help you to work out how much Zakâh to pay. This tool displays the latest figures/prices (updated daily) for Nisâb (threshold when Zakâh becomes payable) and Mahr (dower/bridal gift). Also includes an explanation of the rationale behind the figures, conversions and calculations.